Emoji Ink is a new site designed for one purpose only: drawing stuff using nothing else but emoji. 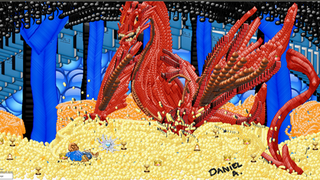 It might sound ridiculous but some people, like Daniel Angione above with Smaug from The Hobbit, have already made amazing pics. It's really easy to use. Just go to the site, pick an emoji and start messing around. You can switch emoji by pressing any key, set the emoji's size on the bottom right, and save your piece on the bottom left.